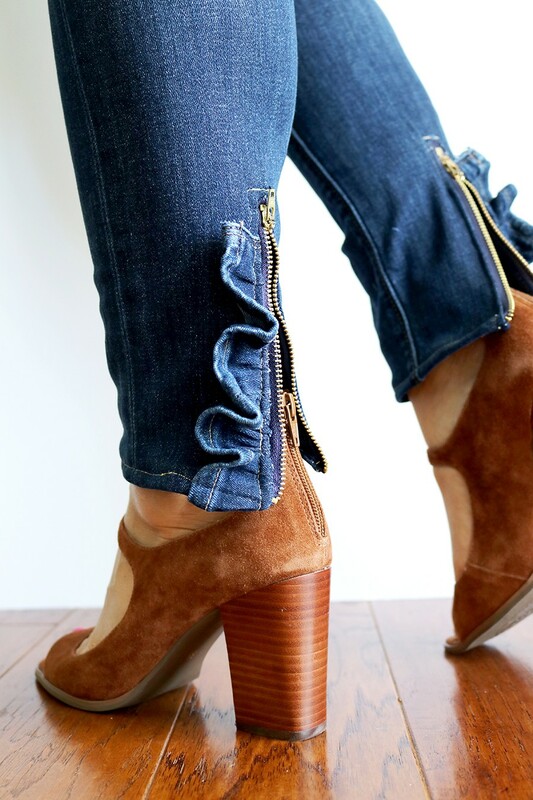 Want to give an old pair of skinny jeans a gorgeous upgrade? how about adding a ruffled zipper to the hem! 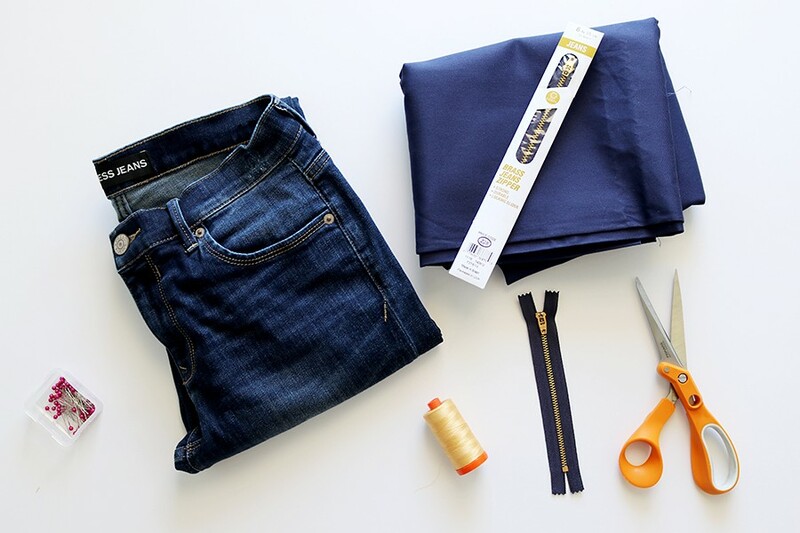 Simply grab a couple of jean metal zippers and your heavy duty fabric scissors, and you can make a fun and pretty upcycled pair of jeans in under 2 hours. The best part? Because of the added back zipper, these jeans convert from skinny to straight leg. Total bonus! You’ll have all of your friends asking where you got them. 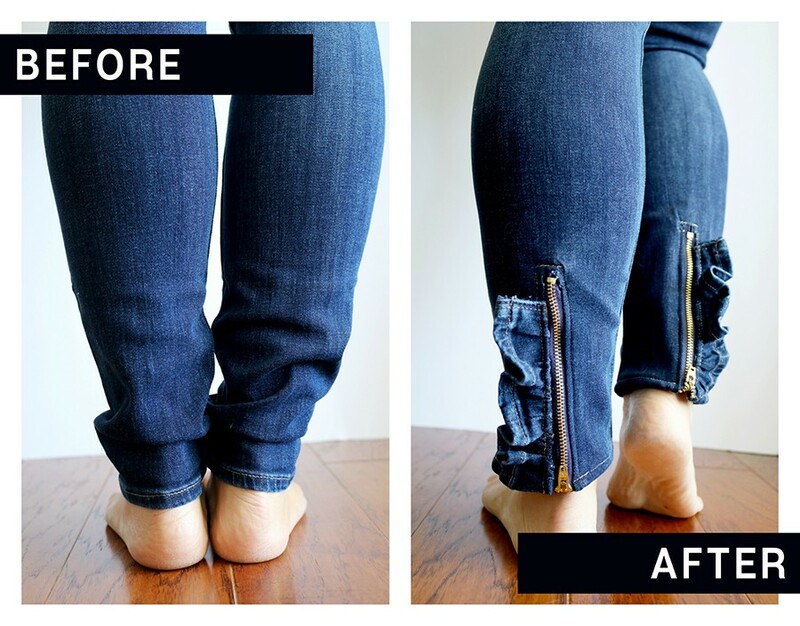 Cut off 2” from the hem of your skinny jeans. Save for later. 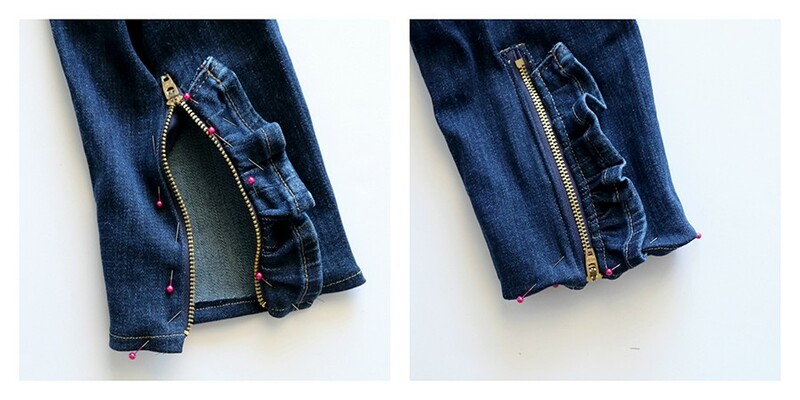 Place the jeans zipper on the back center of your jeans, with the zipper pull ½” above the hem of the jeans. Mark ½” above where the zipper ends. Using your fabric marker, draw a straight line from the hem, to this point. Cut where marked. Repeat for both legs. Fold the bottom hem of the jeans ¼” towards the wrong side. Pin and sew. Cut open the 2” hem, at the heaviest seam. Sew a gathering stitch along the raw edge and gently pull the bobbin thread for nice, even ruffles. 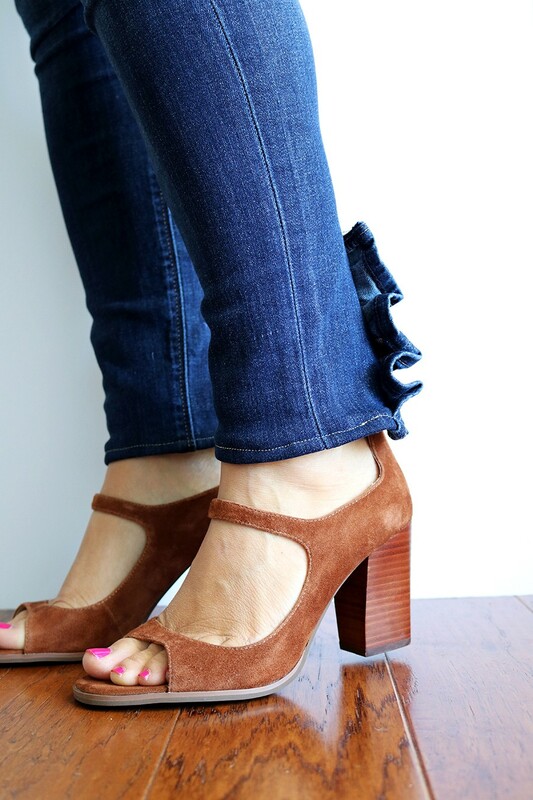 Pin the ruffled edge to the outside cut edge on your jeans, stopping ½” away from the top of the cut opening and ½” away from the hem of the jeans. Baste stitch ⅛” away from edge to secure in place. Repeat for both legs. Cut (2) rectangles from the scrap fabric, 4”w x 8.5”l. Hem the bottom of the scrap fabric by turning one of the 4” sides ¼” towards the wrong side and pressing. 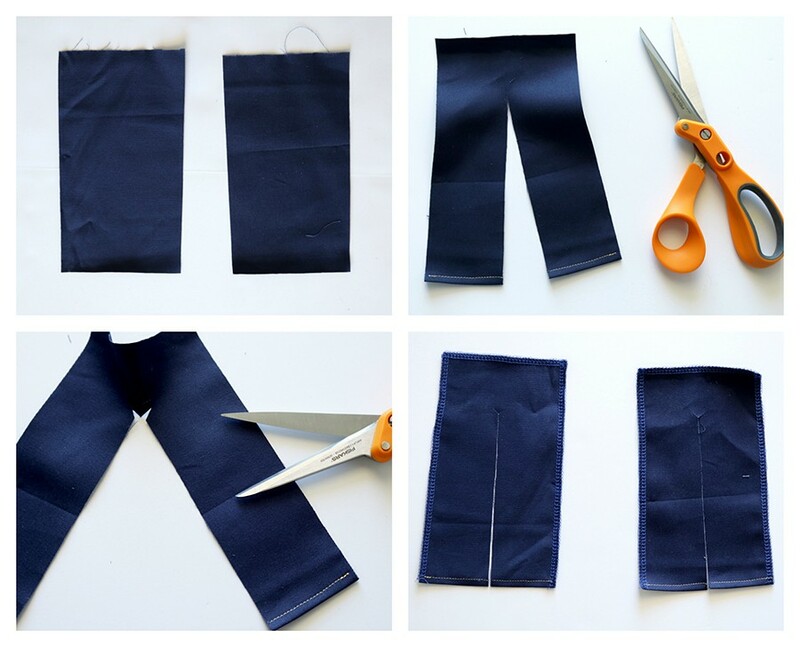 Sew to secure.Cut a slit in the middle of each rectangle, the same length as the one in your jeans leg. 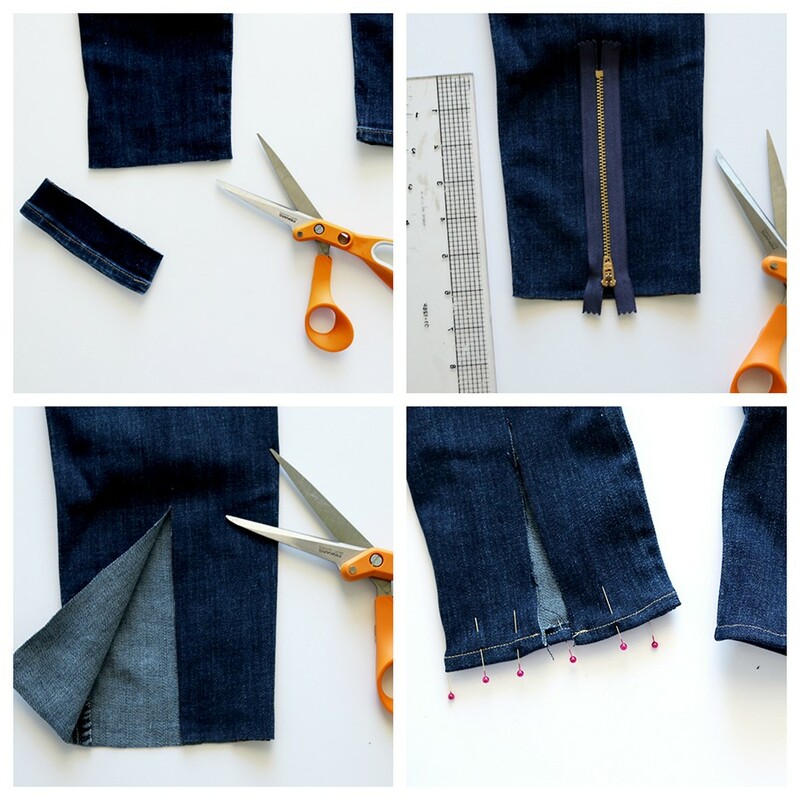 At the top of each slit, for both jeans and scrap fabric, cut two small ¼” diagonals at a 45 degree angle. 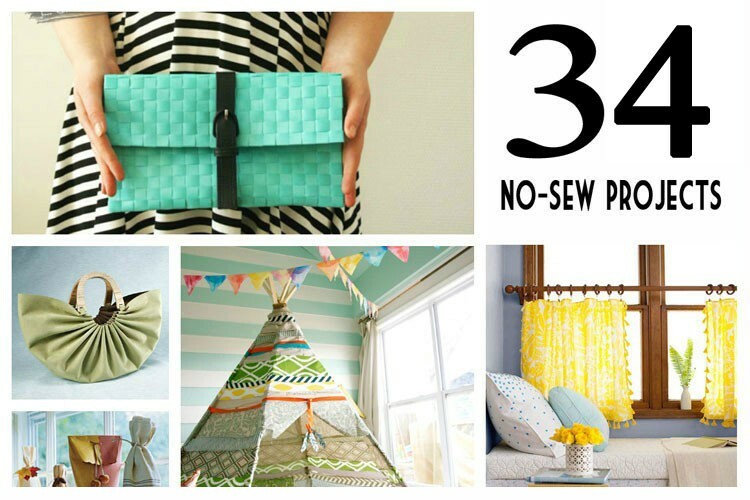 Finish side and top raw edges of scrap fabric rectangles with either a serger, zigzag stitch or pinking shears. 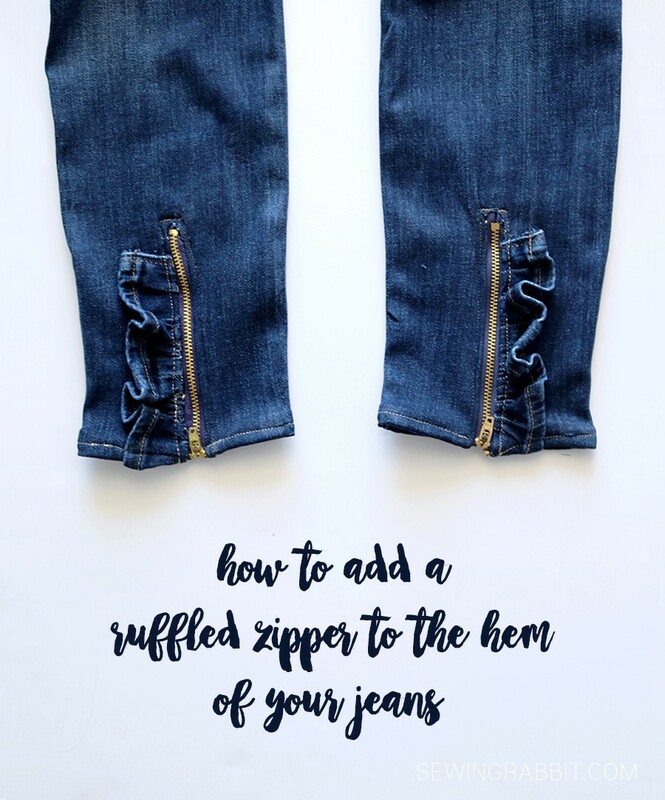 Place the zipper right sides together with the non ruffled side of the jeans leg, matching up the outside of the zipper with the slit edge. 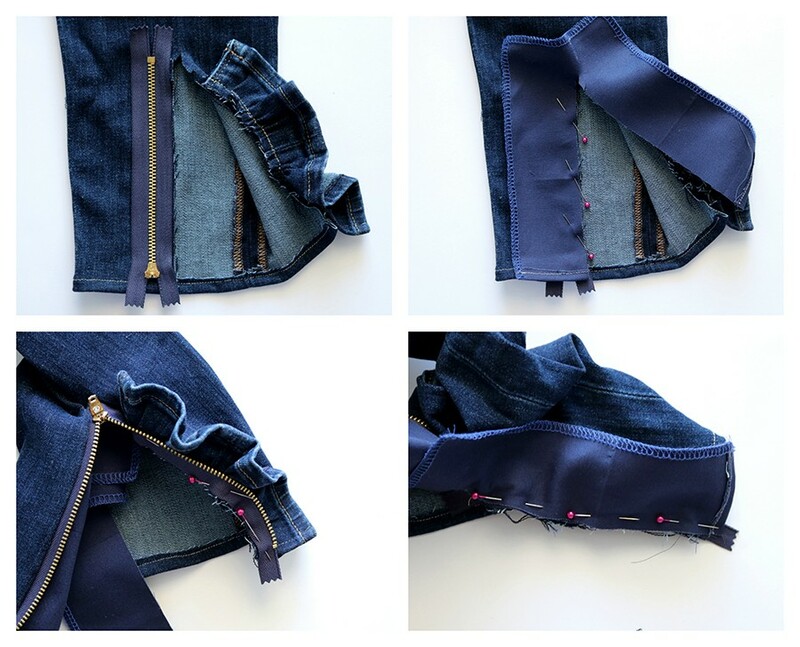 Pin in place, and use a zipper foot to baste stitch in place ⅛” away from the edge. Place fabric scrap right sides together with jeans leg, matching up the slit raw edge and sandwiching the zipper in between. Pin in place and sew using a ½” seam allowance. Open up the seam and unzip. 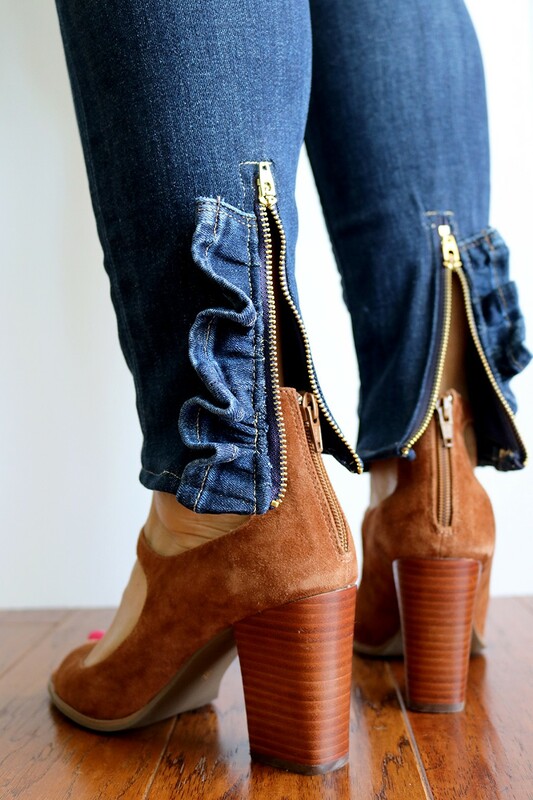 Carefully flip the zipper over and around to the other side of the jeans, appropriately matching up the raw edge of the other side of the zipper, with the ruffled raw edge of the jeans. Pin in place and baste stitch to secure. Repeat for the scrap fabric, matching up the raw opposite slit edge making sure not to twist the top of the fabric when doing so and sandwiching the zipper in the middle. Pin and sew. Repeat for both legs. 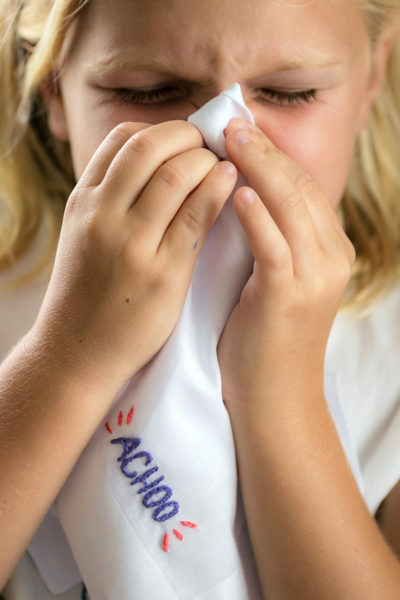 Push the fabric to the inside and pin all around. At the top of the zipper, push in any fabric that might be showing from the cut triangles and pin in place. Sew to secure all around, going back and forth over the top edge to secure in place. Make sure that when you are sewing over the ruffle, sew slowly and carefully while pushing the ruffle down evenly, so that you do not break your needle sewing through that much fabric. Repeat for both legs. 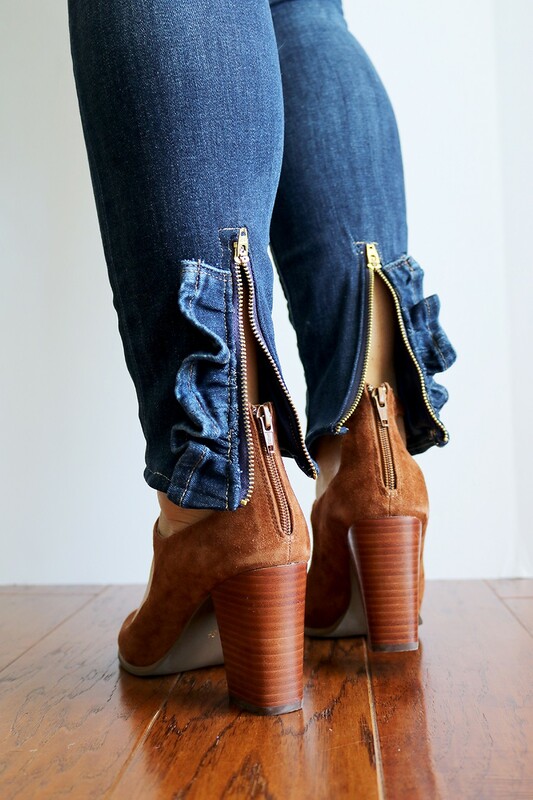 Enjoy your new one-of-a-kind fabulous upcycled jeans.